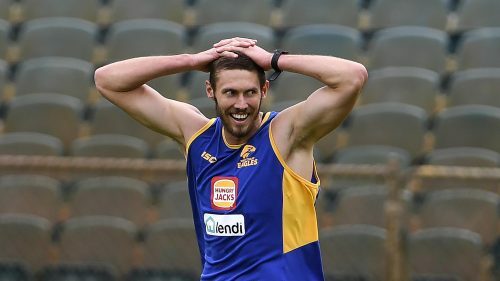 West Coast Eagles recruit Tom Hickey won’t be satisfied just being a placeholder until injured star ruckman Nic Naitanui returns next season, with the ex-Saint bullish he can challenge incumbent Nathan Vardy for a spot. Hickey was targeted by the Eagles during the NAB AFL Trade Period after Scott Lycett’s free agency defection to Port Adelaide left the reigning premiers short for big men. Naitanui isn’t expected back until the second half of 2019 after his second knee reconstruction, and Hickey is eyeing a round one debut for his third club alongside premiership-winning tall Vardy, if Coach Adam Simpson persists with two ruckmen. But the 27-year-old is confident he can also challenge Vardy, and play a role supporting Naitanui once the ruckman returns. Hickey, who married partner Chloe last week, was lured west on a three-year deal by the prospect of success and joined the Eagles’ first-to-fourth-year players on their return to training at Subiaco Oval on Monday. “There is just a buzz around the club and all of the boys are up and about and I assume it is going to be no different when the five-year (players) come back,” he said. Hickey was originally drafted in 2010 by Gold Coast, where he played 12 games in two seasons, and has never featured in a final. The 201cm tall said it seemed “too good to be true” when West Coast came knocking after a frustrating campaign when he played 13 matches and battled Billy Longer for the No.1 ruck spot at St Kilda. Hickey, who averaged 14.5 disposals and 24 hit-outs last season, believed his aerobic ability would be his main asset at West Coast. But he wants to improve his ruck work after ranking below average for hit-out wins (41.3 per cent) last season, according to Champion Data.